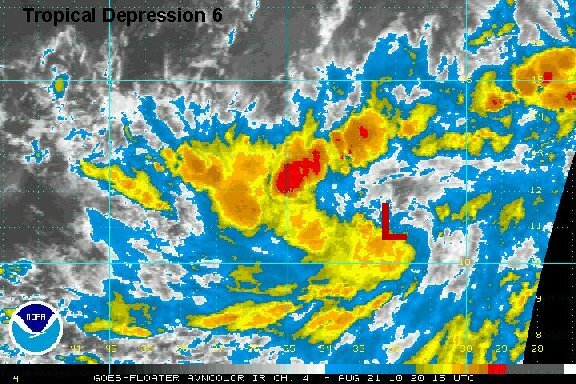 A strong tropical wave has finally strengthened into tropical depression 6. Early forecasts take td 6 several hundred miles northeast of the Leewards several days from now. After that it will possibly move east of Bermuda, but that is too early too call yet. 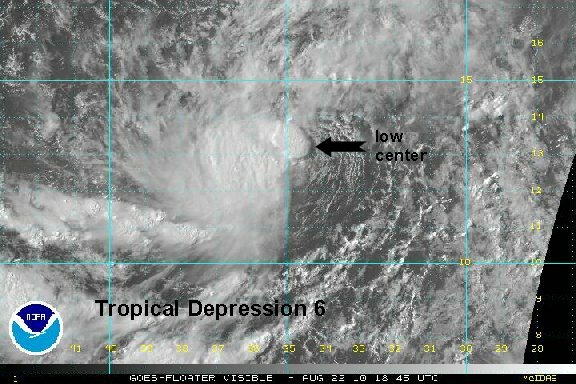 As of 5 pm edt / ast tropical depression 6 was centered 11.0 N / 32.1 W or about 580 miles west southwest of the southern Cape Verde islands / 2000 miles southeast of the Leeward Islands. Top sustained winds are 30 mph. Movement is wnw at 9 mph. Pressure estimated at 1008 mb. Conditions will be favorable for strengthening and TD 6 will likely strengthen into a hurricane. Visible satellite imagery shows a well defined surface low with deep convection expanding near the center and west of the low. A recent satellite estimate placed this tropical low with 37 knot winds. This looks reasonable and we think that Danielle has formed. Conditions are favorable for strengthening and Danielle will likely become a hurricane over the next couple of days. As of 8 am edt / ast tropical depression 6 (Danielle) was centered 12.2° N / 33.8° W or about 1850 miles east southeast of the Leeward Islands or 2400 miles southeast of Bermuda. Top sustained winds are 40 mph (NHC 35 mph ). Movement is wnw at 9 mph. Pressure estimated at 1007 mb. 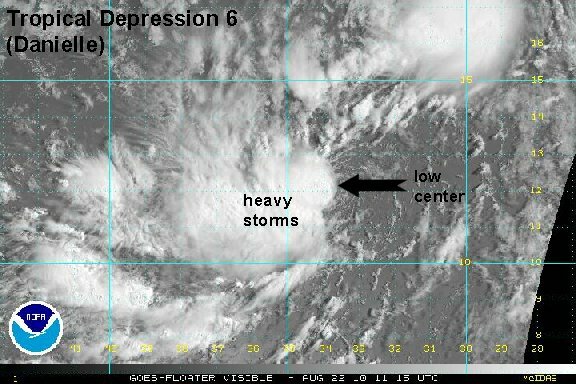 forecasts models generally take tropical depression 6 (Danielle) west northwest then recurve it northwest. This would take it well northeast of the Leewards then toward the general direction, but still far from Bermuda by Friday. The question is - does an upper trough pick it up at this point and take it into the open Atlantic waters? If not, Bermuda and possibly parts of the eastern seaboard will need to start watching Danielle. Do not panic - there is plenty of time to watch Danielle. It is still a long way from land. After strengthing this morning, wind shear picked up and stripped the convection from the center of circulation. Showers and storms have rebuilt near the center over the past few hours. In our estimation, TD 6 was briefly a tropical storm this morning, weakened some, and now again is probably close to tropical storm strength. TD 6 also made a turn to the northwest, but looks to have resumed a more west northwest direction over the past few hours. Shear has weakened, so another strenghting trend has begun. As of 3 pm edt / ast tropical depression 6 (Danielle) was centered 13.3° N / 34.7° W or about 1775 miles east southeast of the Leeward Islands or 2300 miles southeast of Bermuda. Top sustained winds are estimated at 40 mph (NHC 35 mph ). Movement is wnw at 12 mph. Pressure estimated at 1007 mb. Very deep convection has built near and west of the center of circulation for several hours now. 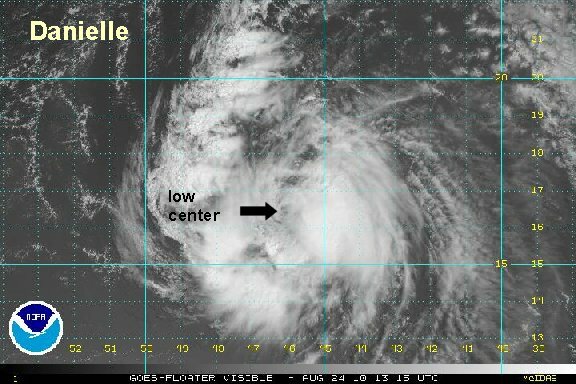 Danielle is strengthening quickly and may become a hurricane on Monday at this pace. We have a little different position and motion estimated than the hurricane center. They are farther northeast - which would account for the nw direction of motion instead of our wnw estimate. As of 11 pm edt / ast tropical storm Danielle was centered near 13.5° N / 36.3° W or about 1675 miles east southeast of the Leeward Islands or a little over 2200 miles southeast of Bermuda. Top sustained winds are estimated at 60 mph (NHC 50 mph ). Movement is wnw at 12 mph. Pressure estimated at 1000 mb. forecasts models generally take Danielle west northwest then recurve it northwest. This would take it well northeast of the Leewards then toward the general direction, but still far from Bermuda by Friday. The question is - does an upper trough pick it up at this point and take it into the open Atlantic waters? If not, Bermuda and possibly parts of the eastern seaboard will need to start watching Danielle. Danielle has strengthened a little more overnight with the surface center circulation displaced still a little off center to the northeast from a mid level center. The hurricane center has adjusted motion to agree with our estimate... now to the west northwest. 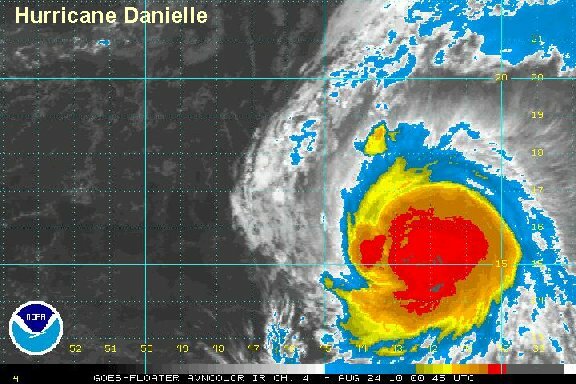 Danielle will possible become a hurricane by later today. As of 6 am edt / ast tropical storm Danielle was centered near 14.5° N / 37.5° W or about 1575 miles east southeast of the Leeward Islands or a little over 2100 miles southeast of Bermuda. Top sustained winds are estimated at 65 mph (NHC 60 mph ). Movement is wnw at 14 mph. Pressure estimated at 997 mb. 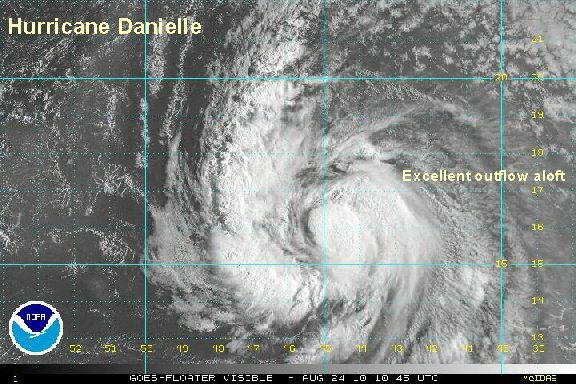 Danielle is showing additional signs of strengthening and is just shy of hurricane strength. Danielle will likely be classified a hurricane at 5 pm edt or the latest at 11 pm edt. NHC shows slow but steady strengthening over the next 2-3 days. It's possbile that Danielle will rapidly deepen, strengthening faster than forecasted. As of 3 pm edt / ast tropical storm Danielle was centered near 15.0° N / 40.5° W or about 1375 miles east southeast of the Leeward Islands or 1935 miles southeast of Bermuda. Top sustained winds are estimated at 70 mph (NHC 65 mph ). Movement is wnw at 16 mph. Pressure estimated at 990 mb. As expected, the hurricane center upgraded to a hurricane at 5 pm edt. 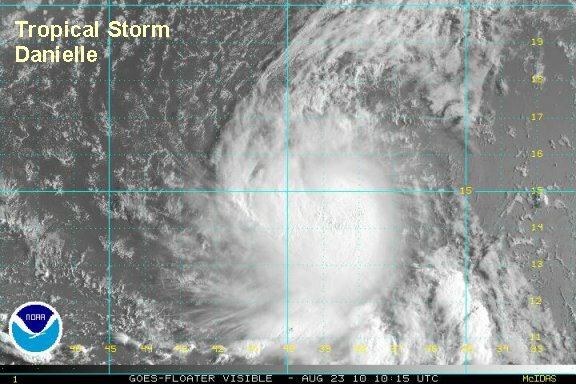 The convection associated with Danielle is becoming more concentric. Outlook aloft is excellent and significant strengthening is likely. There is a very good chance that Danielle will become a major hurricane in the next 1-2 days. As of 10 pm edt / ast hurricane Danielle was centered near 15.5° N / 42.5° W or about 1235 miles east southeast of the Leeward Islands or a little over 1800 miles southeast of Bermuda. Top sustained winds are estimated at 85 mph (NHC 75 mph ). Movement is wnw at 17 mph. Pressure estimated at 985 mb. forecasts models generally take Danielle northwest to a position several hundred miles east of Bermuda by this weekend. 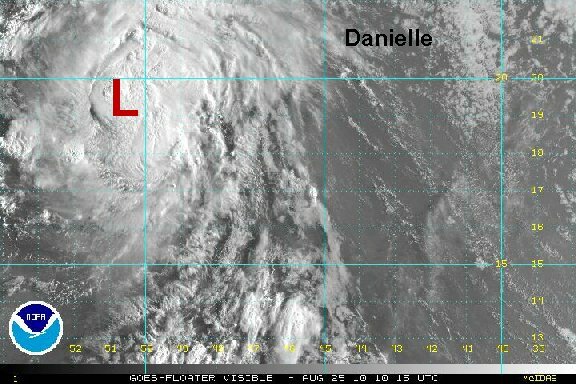 After this Danielle moves northward into the north Atlantic. After fluctuations in organization last night, Danielle has changed little overall. If fact, we are going to estimate lower than the hurricane center since clouds tops aren't as cool. A new rain band has formed to the west and a trend of strengthening will likely commence. Outflow aloft remains excellent to the east and good to the west. 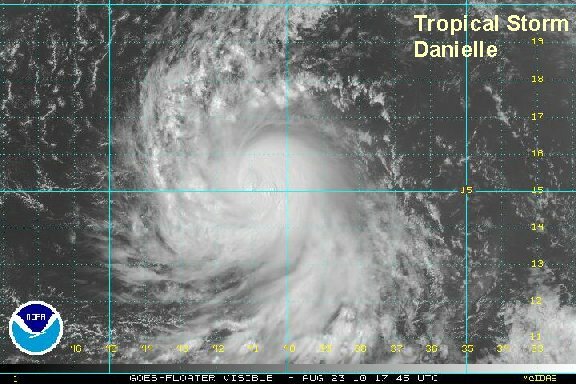 There is still a good chance that Danielle will become a major hurricane in the next 1-2 days. As of 7 am edt / ast hurricane Danielle was centered near 15.8° N / 44.7° W or about 1100 miles east southeast of the Leeward Islands or about 1700 miles southeast of Bermuda. Top sustained winds are estimated at 90 mph (NHC 100 mph ). Movement is west at 15 mph. Pressure estimated at 973 mb by NHC. Danielle has been sheared badly the past few hours and the low level circulation has been totally exposed. Danielle is not a hurricane at this point. Look for the hurricane center to drop winds way down on the 11 am edt advisory - but possibly not below hurricane strength for the sake of continuity. Because of the wind shear disrupting the system pressure must be considerably higher than earlier estimated too. As of 10 am edt / ast hurricane Danielle was centered near 16.5° N / 46.2° W or about 980 miles east southeast of the Leeward Islands or about 1590 miles southeast of Bermuda. Top sustained winds are estimated at 65 mph (NHC 100 mph on earlier advisory). Movement is northwest at 17 mph. We estimate pressure estimated at 990 mb. Much higher than earlier. 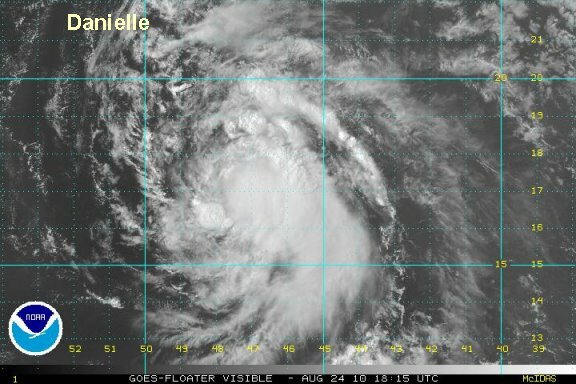 Danielle is still probably not a hurricane, but getting close again. We think that the hurricane center's estimate of 100 mph was too generous earlier. They dropped winds to 80 mph for the last advisory and said that also was probably generous. We think that the winds actually dropped below hurricane strength to about 65 mph. With deep convection building, we think that the winds are up to about 70 mph. 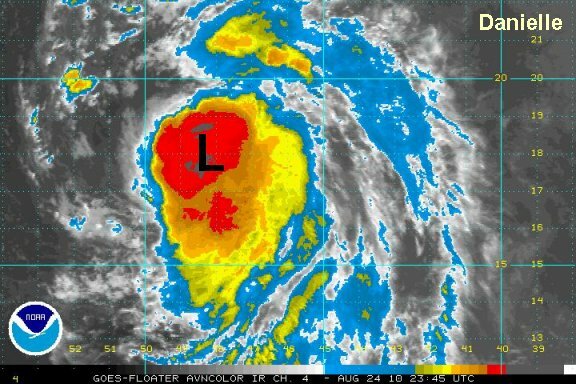 At 3 pm edt / ast hurricane Danielle was centered near 17.4° N / 47.5° W or about 890 miles east of the Leeward Islands or about 1485 miles southeast of Bermuda. Top sustained winds are estimated at 70 mph (NHC 80 mph). Movement is northwest at 21 mph. We estimate pressure estimated at 990 mb. Recent forecasts have shifted a little to the west. Most models take Danielle east of Bermuda by about 100 miles this weekend. This is closer than earlier forecasts. Remember newer forecasts aren't necessarily better forecasts. We'll be watching model trends to see if they actually do have a better handle on the scenario. All interests in Bermuda: Danielle will be at its closest this weekend. Bermuda is a small island and a direct hit from the eye is not likely although still possible. The effects that Bermuda receives can not be predicted at this time. The size and strength of Danielle can not be determined accurately at this point. Swell, rain, and wind are all effects that Bermuda will encounter. The hurricane center dropped winds down to 70 mph at 5 pm to agree with our assessment. Danielle has regained some convection over the past several hours. The surface center is now under the deep convection and additional strengthening looks to begin overnight again. At 9 pm edt / ast hurricane Danielle was centered near 18.0° N / 48.7° W or a little over 800 miles east of the Leeward Islands or about 1400 miles southeast of Bermuda. Top sustained winds are estimated at 75 mph (NHC 70 mph 5 pm advisory). Movement is northwest at 18 mph. We estimate pressure at 990 mb. 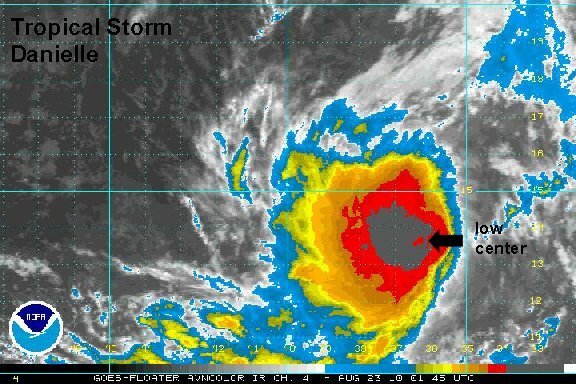 Danielle had a fairly impressive burst of convection several hours ago which now has calmed down. 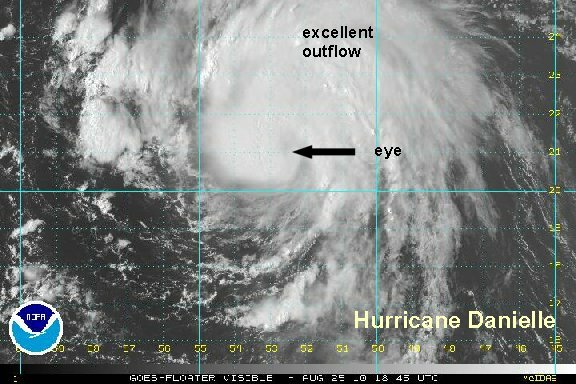 We believe the hurricane center's 85 mph wind speed was based on that burst of convection. Danielle still does not really look that well organized at this time. At 7 am edt / ast hurricane Danielle was centered near 19.3° N / 50.9° W or a little over 670 miles east northeast of the Leeward Islands or about 1240 miles southeast of Bermuda. Top sustained winds are estimated at 75 mph (NHC 85 mph - 5 am advisory). Movement is northwest at 17 mph. Pressure at 982 mb by NHC. Most models take Danielle east of Bermuda by about 100 miles late this weekend. After that, north to the north Atlantic - east of Nova Scotia, and eventually northeast. All interests in Bermuda: Danielle will be at its closest late this weekend. Bermuda is a small island and a direct hit from the eye is not likely although still possible. The effects that Bermuda receives can not be predicted at this time. The size and strength of Danielle can not be determined accurately at this point. Swell, rain, and wind are all effects that Bermuda will encounter. Deep convection is building around the eyewall and the anticipated significant strenghtening is starting. The eyewall is strong on the west side and just building on the east side. Once the deep convection becomes more symmetrical, more significant strengthening will occur. At 3 pm edt / ast hurricane Danielle was centered near 21.0° N / 52.5° W or a little about 590 miles northeast of the Leeward Islands or about 1085 miles southeast of Bermuda. Top sustained winds are estimated at 90 mph (NHC 85 mph - 11 am edt advisory). Movement is northwest at 17 mph. Pressure at 982 mb by NHC....probably down to about 975 mb now.